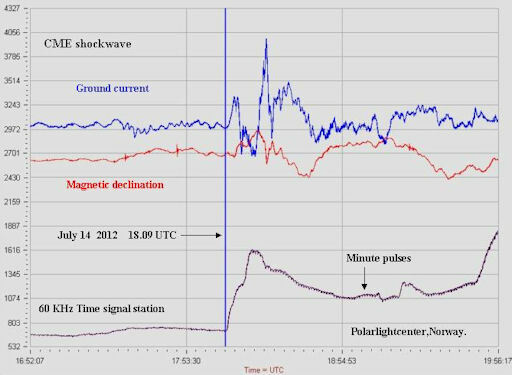 CME IMPACT: As expected, a CME hit Earth's magnetic field on July 14th at approximately 1800 UT or 11 am Pacific Daylight Time). A geomagnetic storm is brewing in the wake of the impact. At the moment, conditions appear favorable for auroras over high-latitude places such as Canada, Scandinavia, Antarctica and Siberia. It is too early to say whether the storm will intensify and bring auroras to middle latitudes as well. Stay tuned for updates. Aurora alerts: text, voice. Stammes has observed many CME strikes from his laboratory at the Polar Light Center. He says this one was not particularly strong, at least in terms of ground currents. Whether this presages an equally muted display of Northern Lights remains to be seen. 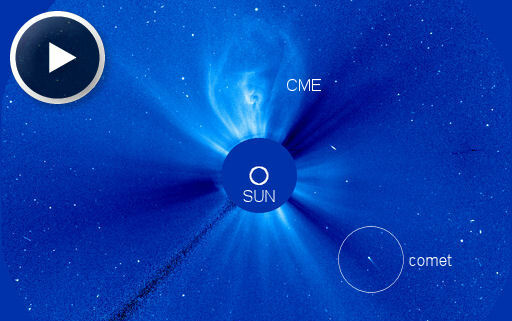 "Discovered in 1986, Comet 96P/Machholz is a fascinating comet that has passed through SOHO coronagraph images four times now," says Karl Battams of the Naval Research Lab. "It's not a huge comet but it is very photogenic, and puts on quite a display with its beautiful dusty tail." In an essay posted on his web site, Battams explains why the comet is so fascinating. Many researchers suspect 96P/Machholz is not a native of our solar system; some chemical evidence suggests it came from another star. Also, 96P/Machholz appears to be dynamically related (that is, the comet's orbit is related) to a diverse collection of other objects in the solar system including asteroid 2003 EH1 and the Quadrantid, Southern Delta Aquariid, and daytime Arietid meteoroid streams. All of these things--the asteroid, the comet, and the meteoroids--might be fragments of a single "foreign" body that broke apart thousands of years ago. Comet 96P/Machholz will be visible in SOHO coronagraphs until July 17th. Battams believes the comet will reach a peak brightness of 2nd magnitude--not its best show. "But who knows," he says, "maybe Comet Machholz will do something completely and utterly unexpected like fragment into a swarm of Machholzlets." Join SOHO for a ringside seat. On July 14, 2012 there were potentially hazardous asteroids.